You may have heard of companies like WePay and Oscar. WePay is an online payments service provider; and Oscar is a user and technology-centered health insurance company. And you might have witnessed how these fintech companies are contributing to the transformation of the financial services sector in the United States. But what’s happening in the global south? There, “inclusive fintech”, or fintech products and services that serve the bottom of the pyramid, is thriving in its own right with the likes of Tala and Branch. 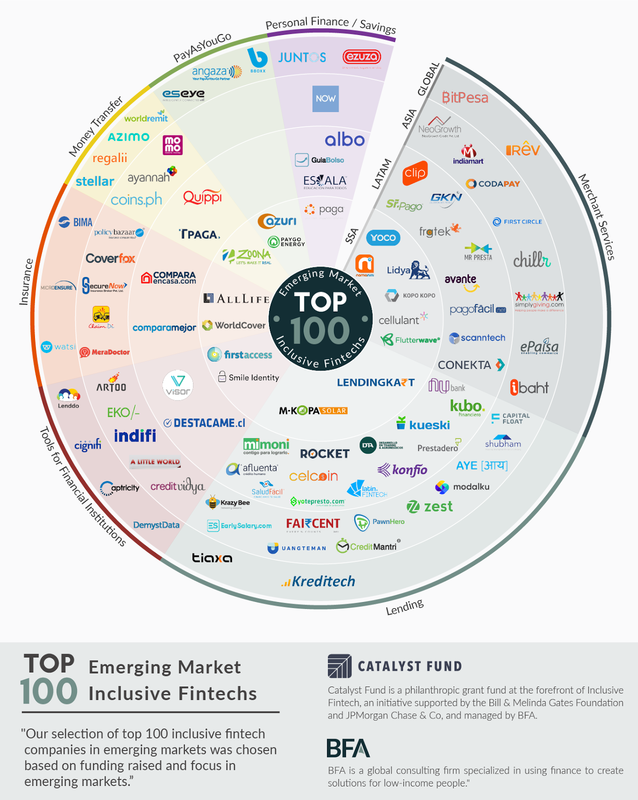 The sector is growing – enough to compile a list of our top 100 inclusive fintech companies by funding raised in emerging markets. As in advanced economies, the promise of emerging market fintech lies in its ability to quickly harness the latest tech and successfully tap into evolving consumer behavior. What drives this ability isn’t an elusive ingredient. It is the adoption of lean product management and design – a mindset and set of processes that have historically been easier for newer and smaller companies to adopt. While delivering technical assistance to our portfolio of inclusive fintech startups, Catalyst Fund has observed key areas where innovative fintech startups have an advantage over banks and other legacy players. Specific characteristics of modern technology and tech firms using these approaches enable these improved outcomes. Alternative credit scoring: Inclusive fintech companies are injecting powerful tools into the financial services ecosystem to help democratize finance. Many low-income people don’t have credit histories or collateral. By harnessing non-traditional sources of data, like mobile data points and social networks, alternative credit scoring companies such as TALA, Lenddo, and DemystData can open lending opportunities to customers that banks might have overlooked in the past. Since 2011, Lenddo has helped 2.4 million applicants reach greater financial inclusion, for example. Destacame* has helped about 1,000 people get loans for the first time. In addition, it’s enabled over 200,000 Chileans and Mexicans to check their credit for free. Insurance: While alternative credit scoring has an obvious role in opening up financial services to more people, other sectors are doing the same for other products. In the insurance space, Bima, the leading insurtech provider in emerging markets, has reached 24 million people, 90% of whom have never had insurance before! Brazilian ToGarantido* also boasts that 90% of its current customers are accessing insurance for the first time. Whereas farmers do not usually have any crop insurance in Ghana, 95% of farmers in WorldCover’s* customer base are now covered by policies. Inclusive fintech has been able to offer more affordable prices and flexible payment plans, especially through Pay-As-You-Go (PAYGo) models . PAYGo solutions allow customers to pay daily, weekly or even monthly for good and services, instead of large lump sums upfront. PAYGo Solar: The PAYGo model has helped customers access more affordable products in a number of sectors, such as clean energy. Users can prepay for electricity when they have funds available without the prohibitive upfront costs. For example, Angaza Design, a developer of solar-powered household lighting and charging systems for rural developing markets, employs an innovative PAYGo system. In sub-Saharan Africa, where households can spend up to 10-25% of their income on fuel expenses, customers can start off with a small down payment ($1-$5), followed by weekly payments of $1-2 to access solar power. PayGo Energy* has developed its own smart metering technology that records gas consumption, monitors user credit and shuts off the valve when the user runs out of credit. Customers also benefit from accessing cheaper and more health-friendly LPG as opposed to traditional kerosene. Users of classic financial services have long complained about lengthy contracts, hidden fees and terms and confusing user interfaces. But we’ve seen that faster pilots, iterations and pivots can enable fintech firms to be more user-centered. Fintech companies have, for the most part, adopted design principles that help them get into the shoes of the user and design products that are simple and easy to use, from activation to usage. Lending: For example, Branch recognized that for many of their customers, their app would be the second or third one that inexperienced users would have to learn to navigate after Facebook and WhatsApp. So Branch intentionally designed their UI to have users take one action at a time. Savings: Customers of Escala Educación* enjoy simple explanations and disclosures and much easier application processes than one would experience at traditional banks. Simplicity and user-centric design are just two ways startups can engender customer trust in fintech services. Insurance: MobiLife* allows applicants to activate a policy by answering three questions in its app, with no additional forms or medical checkups. Powerful analytics allow fintech companies to move faster. Whereas a traditional micro-insurer might take days to approve a policy or approve a loan, a fintech firm can do so in minutes through use of big data, algorithms, and/or machine learning. Lending: For example, when you borrow from Konfío, a Mexican startup that offers microloans for small businesses at lower rates than banks do, automation and strong predictive algorithms mean you can get your disbursement in a matter of hours. Digital identity: In Kenya, users of Smile Identity* can take selfies to log into their user accounts and verify transactions. This is tremendously efficient in places where customers have to go through a long process of getting their identity verified, including getting their photo taken at a shop and travelling to an agent or bank. Modern tech approaches and lean businesses practices help fintech companies, both new entrants and incumbents, to “supercharge” finance to make it even more inclusive. These tools are open to all companies and are powerful agents of inclusion to learn from and cultivate. The “data-first, mobile-first” lessons and approaches from fintech startups can especially improve the offering of products and services to be more accessible, easier to use, cheaper, and faster. Today, fintech players can tap into non-traditional sources of data and mobile platforms to know more about low-income consumers and tailor services and products to unlock pent-up demand. And powerful analytics allow businesses to make better decisions and unearth viable opportunities in the long tail of low-income segments. * A company in the Catalyst Fund portfolio, an inclusive-fintech grant fund supported by the Bill & Melinda Gates Foundation and JPMorgan Chase & Co, and managed by BFA.